Notes: Casual atmosphere, great coffee & service. Free wi-fi, nice space to work. Much like their other location, the ambiance in here is casual and funky. There is lots of wood and vintage details like stained glass - I love the stained glass hanging under the skylight (see the above picture) - it's so cute. There are tons of plants around, reclaimed furniture and records on the stereo. The coffee space is a bit loud - very loud, but next door there is a huge 'lounge' with lots of chairs and plugs, and it is much quieter even with several groups of people chatting. Perfect if you have a meeting you need to do - especially as there is one and two hour free parking available nearby (just don't over stay, they will multiple-ticket you... learned the hard way). Started off feeling a bit shy - it's pretty loud in the main part of this space and the server behind the till had a quiet voice and I had trouble hearing him (I keep telling myself deafness is not contagious, but I suppose you never know). Still - he was very friendly about it and laughed along when I blamed it on a lack of coffee. Even when they asked me to move out of the main space with my laptop and onto the other side I didn't mind because they were so nice about it. After a few minutes Logan came in and joked I have my own private office as the place was totally empty except for me (that's changed over the last half hour) Mmmmm. Bonus points for it being clock-tick-echoing quiet. 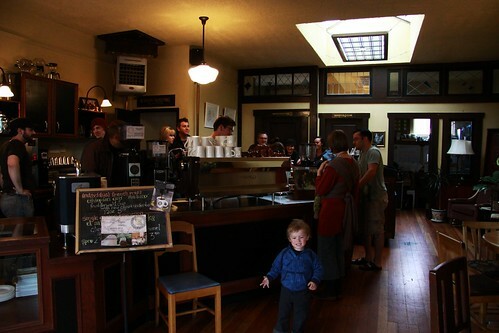 Logan, the owner, who I've seen dozens of times but only discovered (ha) who he was at Fernwood Bites, made me coffee so clearly it was the best coffee I've ever had. It was pretty close, there was a smiley face which always makes me smile and the flavour was delish! I also tried one of the Foi Epi danishes with Rhubarb (sorry about the lack of photos; iPhone is still broken), although it wasn't quite as fresh as I've had in the past it was still so delicious I had inhaled it before my computer even rebooted. I don't love too-sweet, too-bready pastries or muffins, but a croissant with a bit of fruit or chocolate in it is my absolute favourite. These danishes fit that criteria as well - I'm planning to head to Foi Epi for a full blog post of just them shortly.